It’s entirely possible that everyone shares this same gripe, but I feel summer has been flying by this year. Even more so than usual. The days go faster, the schedule seems busier, and all I want to do is slow the calendar down. I don’t even want to talk about autumn, but those back to school sales are in full swing, and I saw plenty of plasticky orange and yellow fall decorations lining the shelves of the local mart, just waiting for the summer haters to open their wallets. 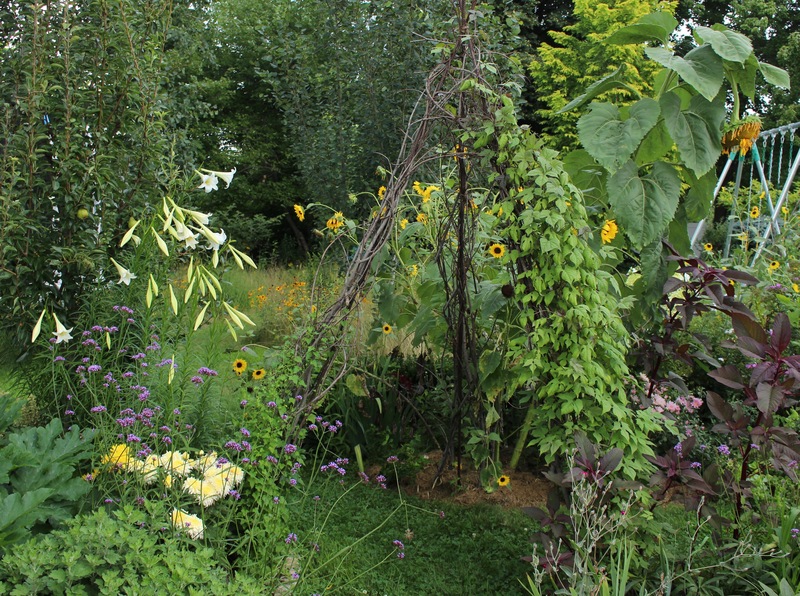 In the meantime here’s a quick, picture heavy run-through of the garden in high summer. It’s my favorite time of the year out there. Annual standing cypress has seeded in nicely anywhere the mulch used to be and brings some bright red to the border. These photos were taken over the weekend, and it was just the beginning of our latest round of gully ripping downpours that hail from the tropics. Monday I think we topped another three inches and unfortunately that does not bode well for the lower lying areas. The plants seem fine though. 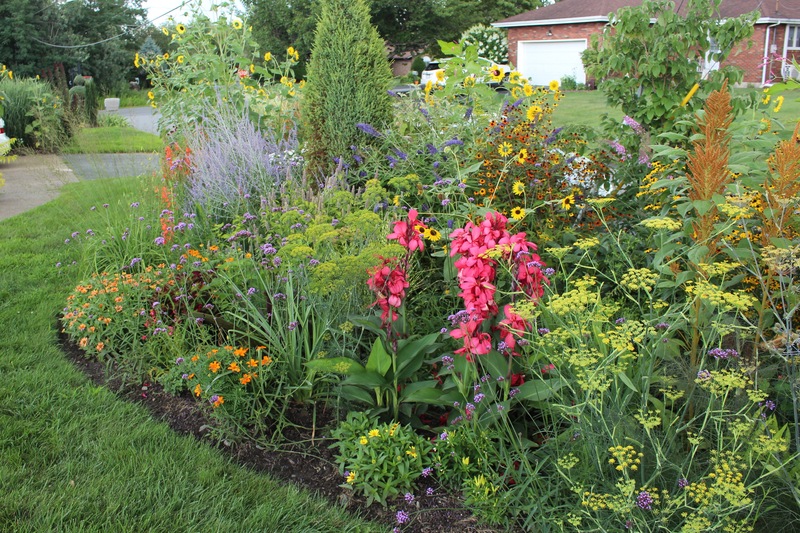 Everything is lush and vibrant and other than a little floppiness and extra height it sure beats dealing with another year of soil-cracking drought. A pale sunflower out along the street. I always love them against the feather reed grass. Even with the dampness and humidity it’s much more pleasant to dig in freshly-watered soil than it is to pickax your way through a dry and dusty crust. With some time on my hands and a little too much ‘exuberance’ in the front border I did some editing. You barely notice the vacancies. Nothing like a big dig project on a 90F degree day. Of course the weeds have been a nonstop battle. I finally broke down and bought a few bags of mulch in hopes of clearing out a spot in back… which is definitely out of control. Needless to say it is still out of control, but I used the mulch to neaten up a couple edges in front and that made me even happier. Maybe I’ll crack open the wallet again for a few more bags. It’s slightly addicting. My “other” popcorn plant, actually a candlestick plant (Senna alata aka cassia) showing off some of its cool leaves. In the meantime I just love all the color and the busyness of bees, and bugs, and hummingbirds and goldfinches zipping around from sunup to sundown. ‘Cannova Rose’ highlighting the front border. 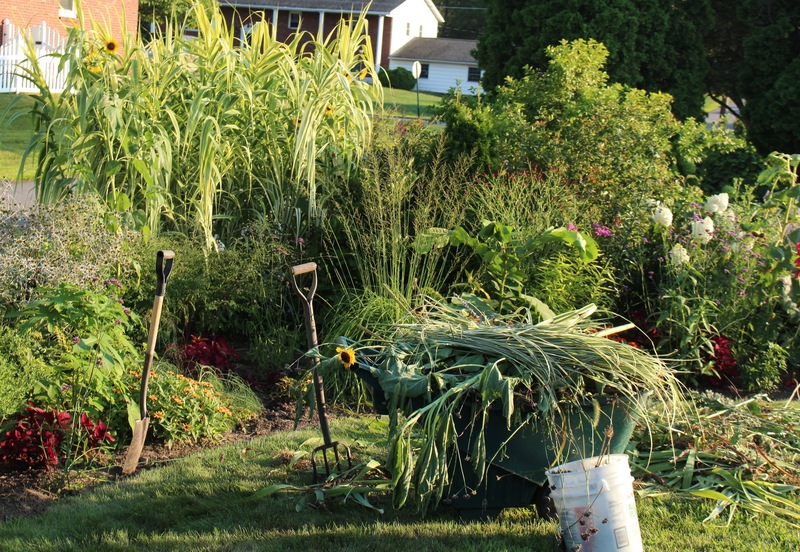 Mulching is rewarding, but for the most part for me this part of the year is more a matter of counting your losses, writing them off, and enjoying the successes. 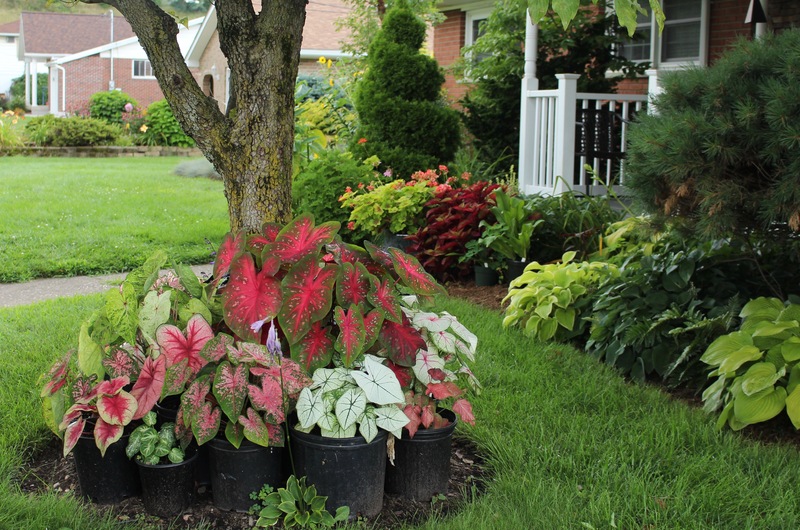 I was hoping last year would be my last caladium year, but apparently the obsession continues. They are one plant which has been thoroughly enjoying the rain and humidity and who am I to turn my back on such happy plants? The caladiums are just happy doing their own thing in a patch of shade. Something I don’t want to talk about too much are the two new daylilies which have shown up. Apparently people like these things, so who am I to not give them another chance? As I was working through the foundation beds (finally), it occurred to me that many of my weed problems might have something to do with me. Every week or two I rip out a couple more milkweed shoots as they try and take over the entire front yard. 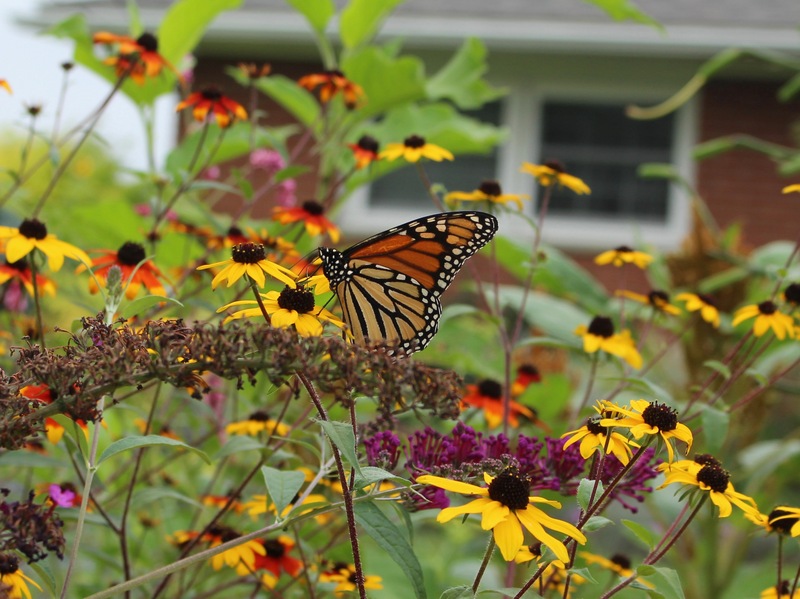 Maybe the ‘weed’ part of their name could have been a tip-off but hey, they showed up on their own and the butterflies like them so I figured what’s the harm in leaving a few. I frequently see eggs being laid but as of yet no caterpillars, and I wonder if that’s the down side to having all those bees and other pollinators flying around. I think they might be adding a little protein to their nectar diets. Milkweed in popping up around the garden. The record so far is 15 feet out into the middle of the lawn! Around back there is definitely a need for some mulching attention. Your best bet is to ignore that, and just look at how nicely the jungle is spreading. Looking over the tropics into the backyard. The cannas are starting to really take off is spite of the crowded planting conditions. 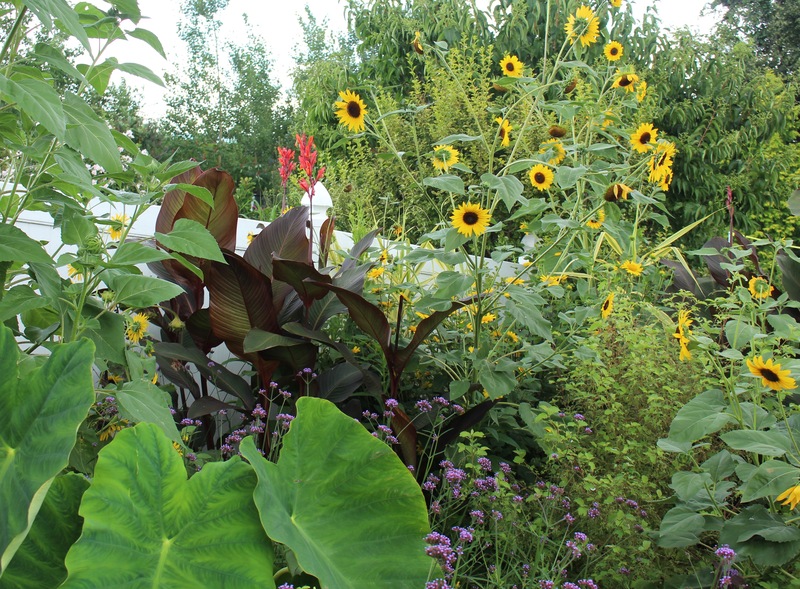 As usual there are too many sunflowers, but eventually the cannas and other stuff force their way through and it’s all good. Canna ‘Australia’ has never looked better. I love the shiny darkness of the leaves and it’s lush growth this summer. I can only imagine what shenanigans are going on in the interior of the bed. The cannas in back have barely made it to six feet. I blame the sunflowers of course! Once you reach the backyard it’s practically a wild kingdom. The potager is now on its own and the selfsowing annuals will take over as I make a weak attempt to save a few vegetables. 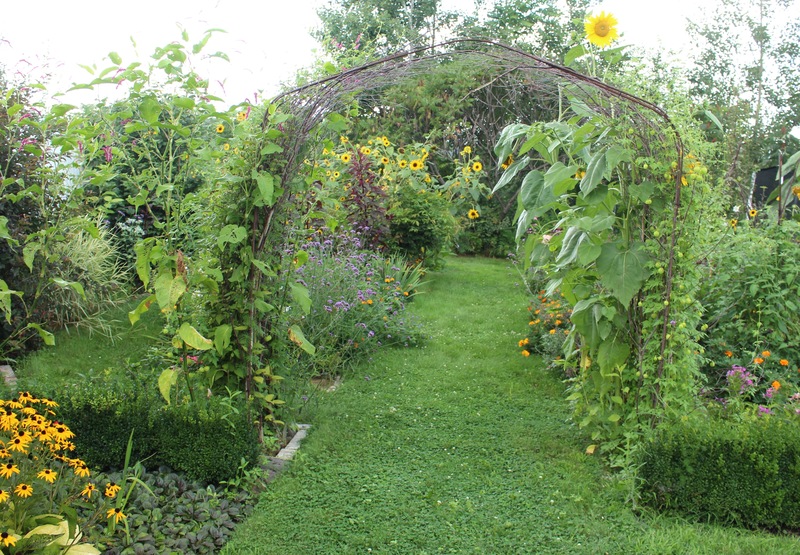 Eight foot sunflowers and persicaria (kiss me over the garden gate) leave little room for a bean plant. The potager is on its own now. I just try and get the mower through and call it a success if I do. There are a few things though. Peppers and eggplants are coming along, but the tomatoes look as if the rain has done them in. 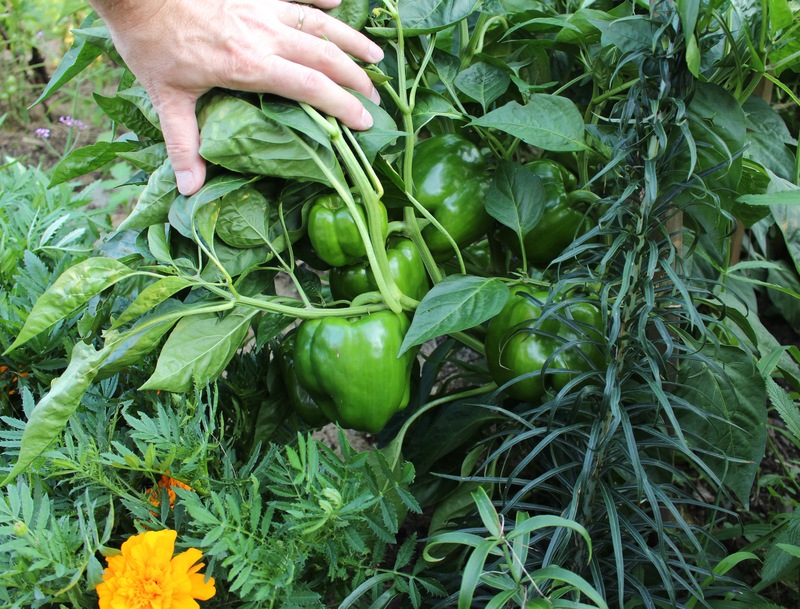 It’s been a good year for peppers! I forgot the zucchini. There’s some of that in the way back. The lilies (Lilium formosanum) are starting out back. They’re always a sign that summer is edging past its peak. Garden visitors are all offered as many succulents as they want. Apparently I haven’t been getting enough visitors! In the meantime enjoy August. I suspect it will go even faster than July! 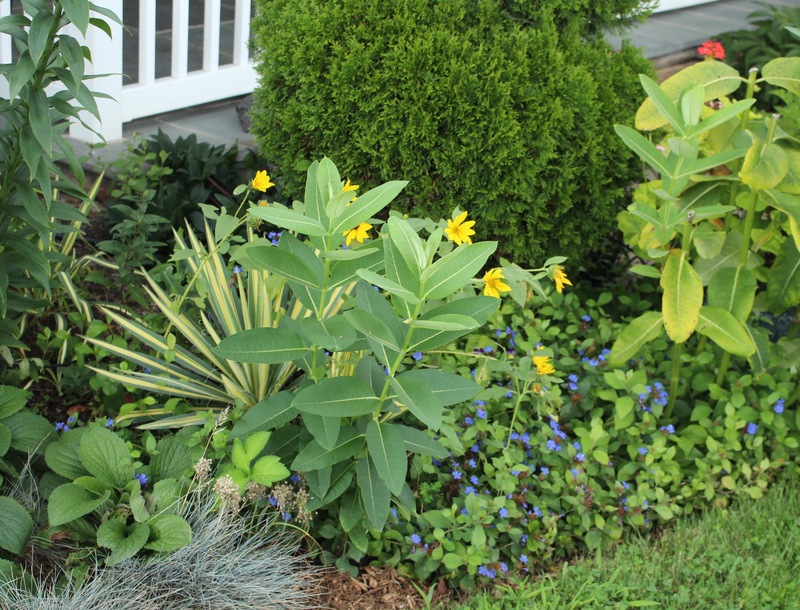 This entry was posted in annuals, foliage, late summer, perennials, Tropical garden, Uncategorized and tagged flowers, garden, gardening in pennsylvania, Summer. I don’t know where it’s going in your beautiful garden, but it ain’t left here yet. My but it’s hot! Must be all the rain and cloudy skies, I think it was getting dark at 7:30 yesterday. That and the fact I saw even more autumn decorations today! You’re right that rain is preferable to drought. It certainly has everything looking lush. Love the peachy dalily with all that dusty blue. That whole foundation planting is impressive. Last year Sept. was very hot and dry so I am hoping we don’t get a repeat. Yes, I hope you do have a decent September this year. I bet it being so dry did not help your conifers at all. I do like the foundation planting this year but it might be time to do something with the fescue. It’s a little thick and I suspect it needs a thatching or something! In spite of the monsoons, it all looks nice, Frank! I should come by and relieve you of some of those succulents, though they make a nice border for your bed, all neatly lined up like that! I have pretty much thrown up my hands in surrender this year, between the rain, the fence-climbing rodents, and my inability to get a mulch delivery arranged. I’m just not finding a lot of joy out there this year, I’m afraid! Already dreaming of next year! Yeah, you’ve really had a rough year, especially with the hordes of groundhogs. One was spotted in the yard here but only stayed around a few days… as far as I know! I’m positive there’s something in the air this year just sucking the gardening enthusiasm out of everyone and putting it into the bugs. Hopefully it doesn’t repeat next year! 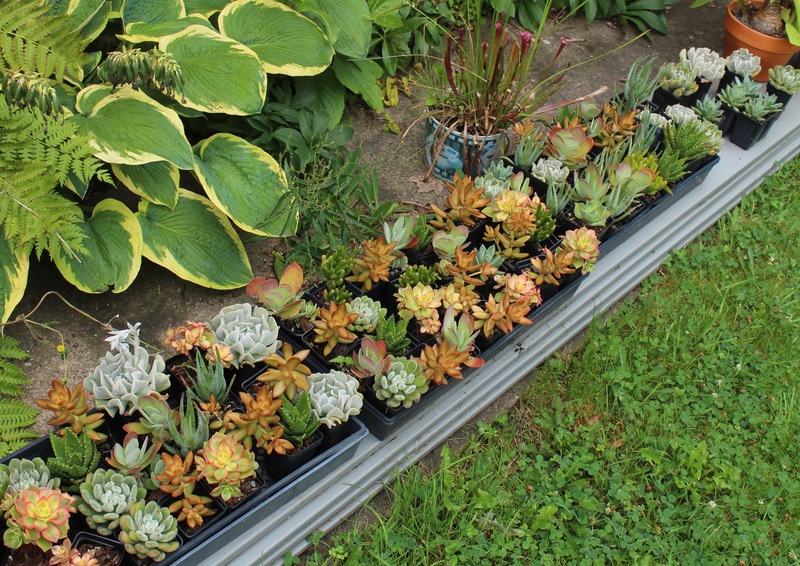 The succulents are right next to the garage… just in case you’re in the neighborhood! I don’t know where summer is going but I do know where your garden has arrived, at a beautiful juncture. 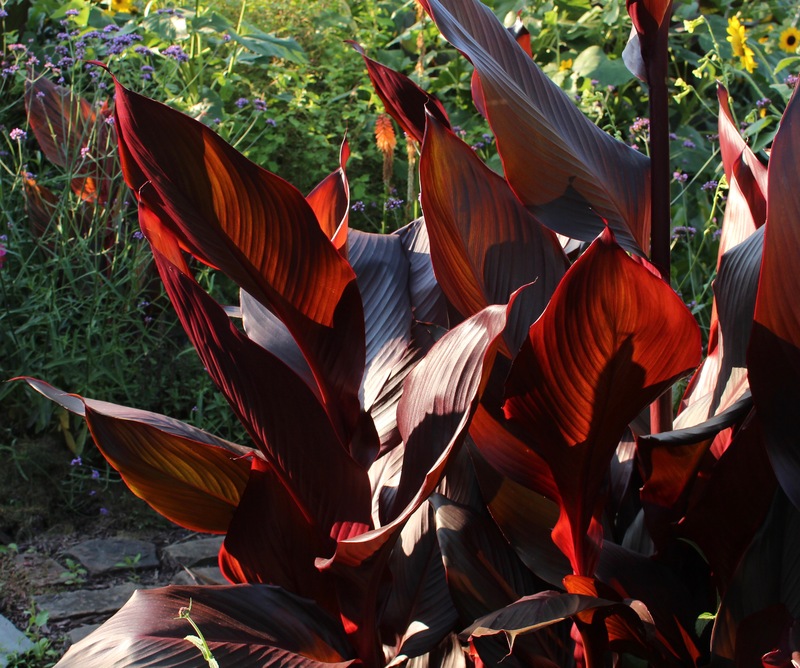 The canna leaves illuminated by the sun are special, they glow. I planted some native plants this week and the ole pick and shovel routine was needed. We could use some of your rain. 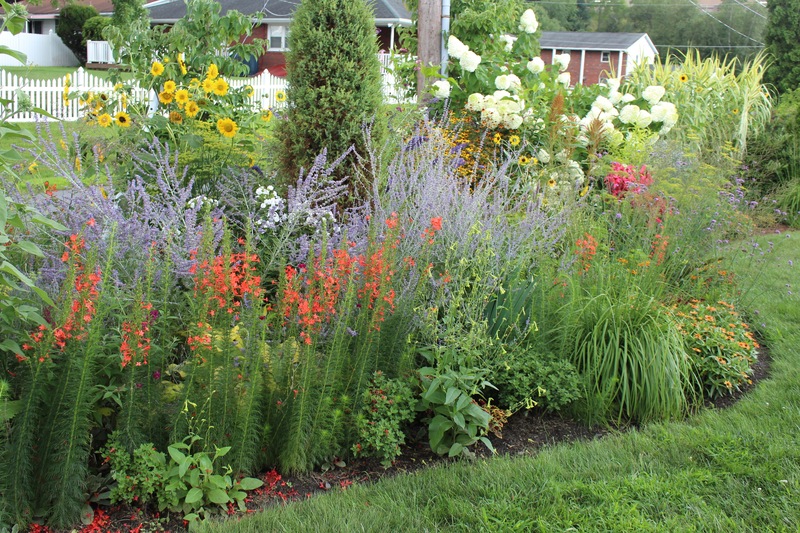 I like all the color in your garden. Even your veg garden is exciting. I am surprised the succulents are not drowned. They appear to be in the perfect spot. I really hope that by now you are getting a little rain, but it takes so much to bring thing back to normal. Digging and planting is so much less fun in dry, hard soil…. and that describes most of our normal summers, so I’m really feeling spoiled by all this rain! The down side to the rain is that many of the plants I’ve put in over the years are geared for droughty weather, and not this. I’ve seen a few things disappear or collapse or just fade away as the whole plant rots. Your garden is just lovely. Anything look better than weed-filled devastation, but don’t be fooled into thinking all is well here! 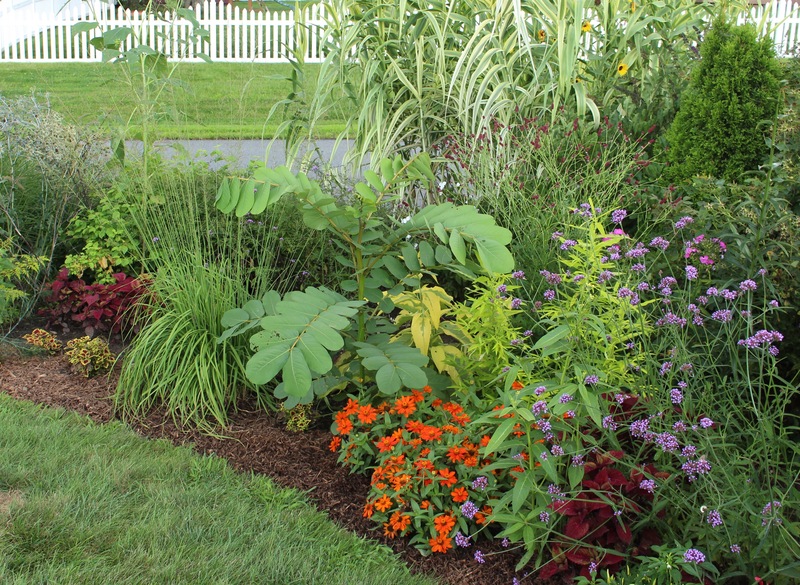 There are plenty of spots overrun with weeds this summer and I feel like the weeding has been nonstop. To save myself the grief I don’t take photos, and in a couple of months I will hopefully only see the good! How is it I have never heard of Standing Cypress? What a gorgeous plant. 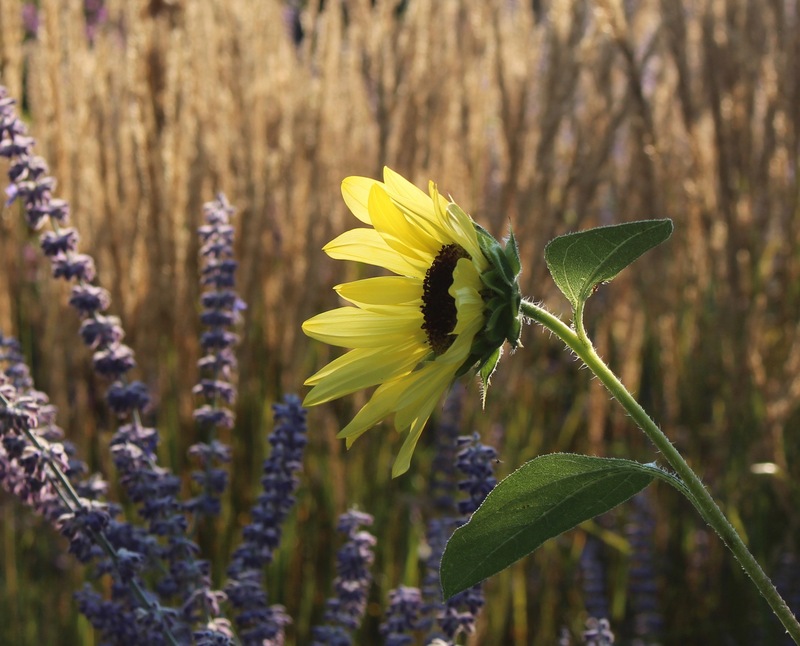 Your garden is looking really fantastic, I especially love the sunflowers scattered around. And yes, summer is passing muchy too quickly. 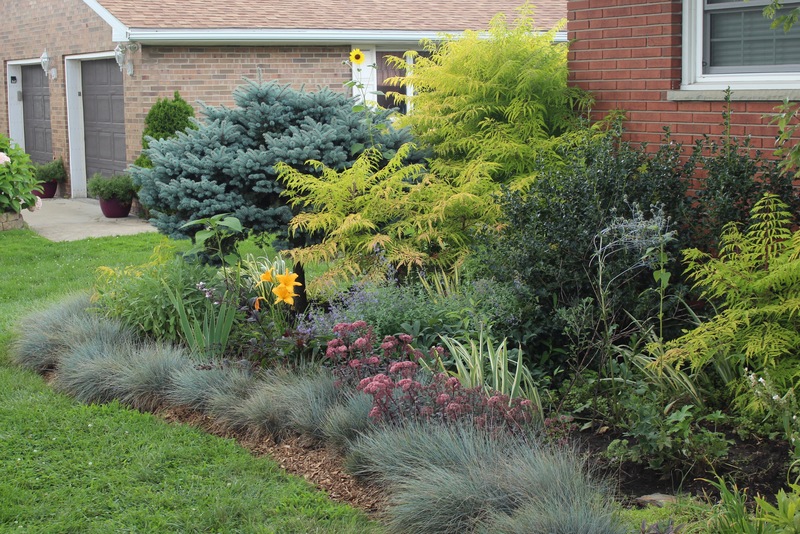 Yeah there are a couple species of standing cypress, mostly reds and pinks and some yellows, but they’re all open garden, full sun kind of plants… even though mine handle the rough and tumble of the garden well enough. 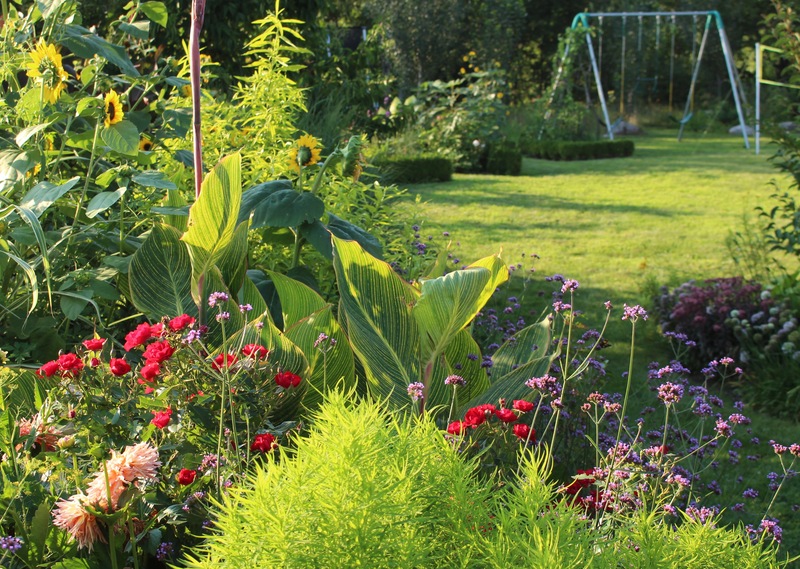 Your garden always looks amazing in late summer. Everything grows so lush and tall and full of exuberance. I love it. I’m going to have a stern word with my midget cannas tomorrow. You would think with all your heat the cannas would have put in a little more effort into this summer. Quite lazy of them if you ask me. This is my favorite time of year in the garden. The flowers are nice enough but when you sit out it’s a steady stream of birds and butterflies during the day, as well as a loud chorus of crickets and other bugs as the sun sets. I wish I had more time to enjoy it.